Doug Ross @ Journal: Great News! 824,000 Jobs Will Disappear on Feb. 5th. The Obamaconomy rolls on, crushing everything in its path. Great News! 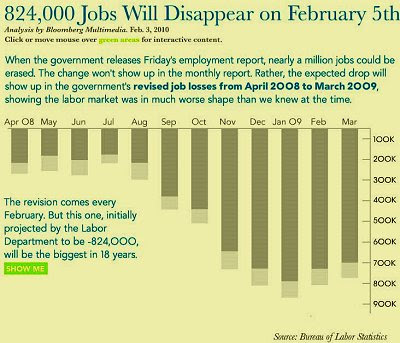 824,000 Jobs Will Disappear on Feb. 5th. The Obamaconomy rolls on, crushing everything in its path. The reason for this adjustment has to do with a huge glitch in the birth-death model, which is exactly the same problem that the rating agencies faced when housing prices plummeted: the birth/death model assumes, in the long-run, jobs are created, not destroyed. Any period of excess volatility in the stock market therefore translates into major prior downward revisions to already disclosed payrolls. ...In essence, a Moody's-like glitch has misrepresented the true payroll picture due to modelling error to the tune of over 1.8 million jobs. How that will impact the president's "jobs saved or created" calculation has yet to be determined. Unless of course all those jobs appear merely on the same excel file that the BLS uses for all it other erroneous calculations. Related: the original Bloomberg presentation.